All transactions are safe and secure with a reliable history in online purchasing behind each of our associates. 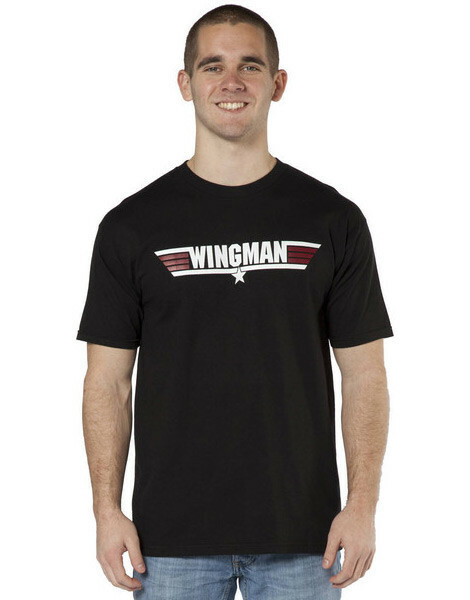 Buy the Wingman t-shirt to own Top Gun clothing and merchandise. This popular black Top Gun Wingman t-shirt is an ode to wingmen everywhere. Whether you support your friend in the skies or at the club, this is the perfect tee to show that you're a true team player. Maverick learns the importance of being a good wingman after he breaks formation to go after Commander Mike "Viper" Metcalf (Tom Skerritt), which ends in Maverick being defeated. In addition to the Wingman tee above, browse the Top Gun Clothing Gallery for more apparel like men's and women's clothes, kids shirts or hoodies.